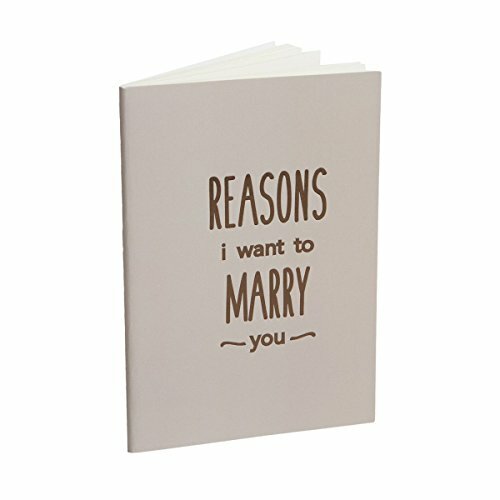 Give the personalized gift of words with these beautiful LoveJoy Printing Press – Reasons I Want to Marry You Journal. Made of high quality 360GSM cover paper and 120GSM interior pages and a brown & gold metallic letterpress impression on the cover; adding just the right amount of shine. • A POWERFUL GIFT: Everyone loves hearing original words from the people they love and care about. It is our hope to help bless your relationship through these journals. We know that taking the time to sit down and journal about those we love has become a lost art in the hustle and bustle of the 21st century. But we want to encourage you to give it a go. Whether it’s through this journal or a piece of paper left for your spouse, TELL THEM HOW MUCH YOU LOVE THEM! • STEP UP YOUR LOVE-NOTE GAME – Beautiful design – the perfect gift for your fiancee, significant other, or spouse. Take your love note game to the next level with this beautifully designed one-of-a-kind journal filled with 40 blank pages to be penned with your choice of doodles, notes, photos, memories, or a simply just a list of reasons you love them. • SMART SIZE FOR YOUR CONVENIENCE: A compact 5.5″ x 4″ design and only 1/4″ thickness allows this journal to be carried comfortably and conveniently in any situation – It even fits in your back pocket so that you can bust it out when the time is right. • UNPARALLELED QUALITY: This journal features quality craftsmanship including a threaded spine to ensure pages stay tightly bound through time after time of re-reading and even tears! Constructed of a high quality, conditioned 360 GSM grayish-beige cover and interior 120 GSM off-white sheets. It also features a gorgeous letterpress and foil-stamped cover that is impressed down into the cover of the journal – reflecting a brown to gold shine. • MAKE IT SPECIAL. MAKE IT YOURS! : Detouring from the pre-boxed, mass produced romantic gift. This journal is sure to bless and encourage whoever receives it. Yes, it will take a little more time, but you know they are worth it! Make their day! It is a perfect gift for an Anniversary, Mother’s Day, Father’s Day, Christmas present, Birthday, or any other occasion that someone needs to know they’re loved.